These excavations were undertaken by Wessex Archaeology as part of a wider series of evaluation trial trenches (Wessex Archaeology 2016a). Two trenches intersected WS71 (Figure 6), and two intersected WS86 (Figure 8). Trenches were excavated by mechanical excavator, and archaeological features hand-excavated. Flotation samples were taken for the recovery of finds and environmental remains. All of the information provided here is from assessment reports, and is thus preliminary. Trench 13 was placed across the two main ditches on the north-eastern half of WS71, although only the north-western ditch was sectioned, proving to be 6.5m wide (Figure 6). The base of the ditch was not reached in excavation but augering located the base at 1.8m below the chalk surface. Unlike in the Historic England work described above, no recut was observed in the north-western ditch; however, there was a stepped profile to the ditch that might hint at this. The top fill of the ditch included seven sherds of Late Bronze Age pottery. Flotation samples produced a modest archaeobotanical assemblage consisting of occasional hazel (Corylus avellana) nut fragments, cereal remains (a single hulled wheat glume base and a few grains) and possible weed seeds. Cereal grains included free-threshing bread/rivet wheat type grain (Triticum aestivum/turgidum), and possible barley (Hordeum vulgare). This mixture of free-threshing wheat and hulled varieties with heterogeneous preservation is typical of mixed assemblages of varied date. Trench 14 crossed the south-western end of WS71, revealing in plan where the inner and outer ditches on the north-western side intersected, but these were not sectioned and the stratigraphic relationship between them was not established (Figure 6). Trench 14 also encountered a cut feature to the north-west of the barrow (not excavated), two cut features roughly midway between the two main ditches (not excavated) and the south-eastern inner and outer ditches of the barrow, both of which were sectioned. These were 2m apart, with the inner measuring 1.6m wide and 0.4m deep and the outer 1.7m wide and 0.3m deep. The fills suggest that both ditches silted up naturally. Further grain and a slightly greater number of chaff items including rachis internodes and glume bases, seeds of wild plants including possible arable weeds and grassland species, and a little hazelnut shell, were recovered from samples from the southern ditch. The range of cereal types (Triticum aestivum/turgidum, Triticum spelta/dicoccum and Hordeum vulgare) and variable preservation, with some exceptionally well-preserved grains thought to be recent, and highly eroded hazelnut shell, again suggested a mixed origin for the assemblage. No trace of a mound was found in either trench but the excavators suggest that a slight doming to the chalk surface between the ditches may result from the former mound offering some protection against plough damage. No Neolithic material was recovered from the ditches, which produced Late Bronze Age pottery. A charred Hordeum vulgare grain from the secondary fill dates to 1440–1220 cal BC (2σ, UBA-33155, 3084±44 BP). The evidence for a recut of the ditch has a precedent at Woodford 2 (WOO2; Harding and Gingell 1986), but it is also possible that the ditch was recut more than once before it was finally allowed to silt up. Such an exercise may not have been just to keep the ditches clear. 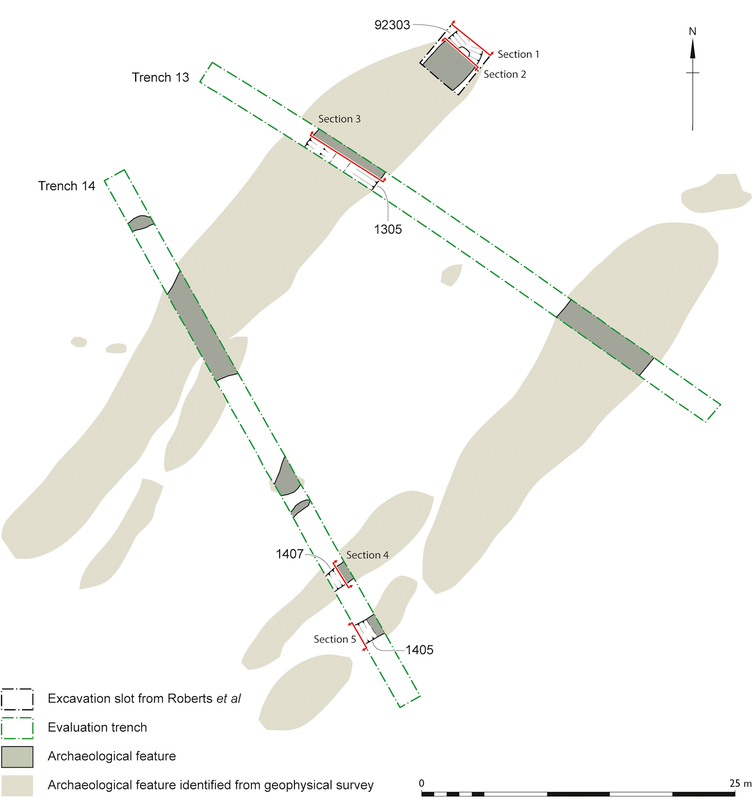 At Amesbury 42 (AM42), a row of Late Neolithic pits cut between the barrow mound and ditch has been interpreted as an exercise in sourcing chalk to recap and re-whiten the long barrow mound, linked to contemporary recutting of the adjacent Stonehenge Greater Cursus, which was interpreted as sourcing material to recap and re-whiten its bank (Richards and Thomas 2012, 37). It is therefore possible that the recut in the ditch terminal at WS71 took place in part to procure chalk from the base of the ditch to recap the mound at its eastern end. Two trenches were excavated across WS86, each intersecting both the western and eastern ditches (Figure 8a and 8b). The eastern ditch was 2–2.4m wide and 1.3m deep (the base was only reached by augering, and only in the southern section). In the northern section the basal fill extended up both sides of the ditch and was cut by two postholes on the inner side and a 0.35–0.5m wide and 0.35m deep near-vertical slot on the outer side, in all cases cutting down to the base of the ditch. 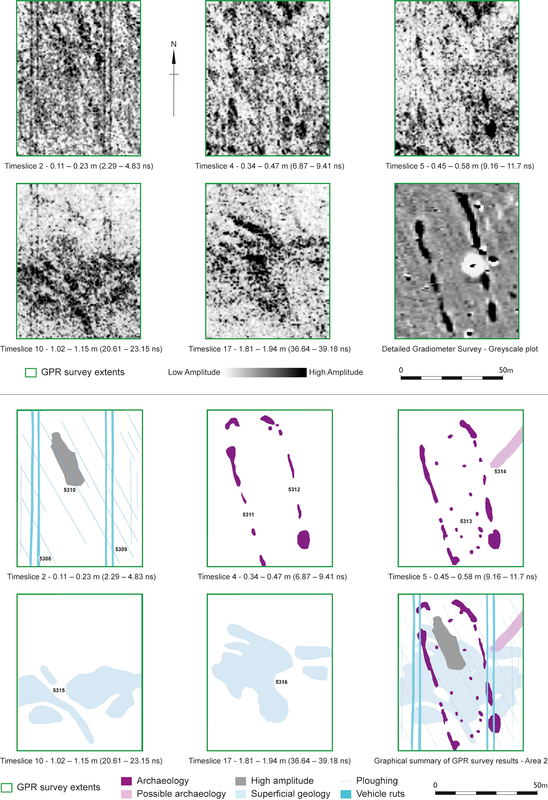 The postholes were between 0.2m and 0.35m in diameter and 0.35m and 0.5m in depth and given their location suggest a post revetment or facing for the barrow mound. However, as these cut the ditch fills they must post-date the monument's construction and initial ditch erosion, and there is no other evidence for later modification/refacing of the monument, meaning this interpretation should be treated with caution. The ditch fills contained worked flint, animal bone and three sherds of Middle Neolithic Mortlake substyle Peterborough Ware. 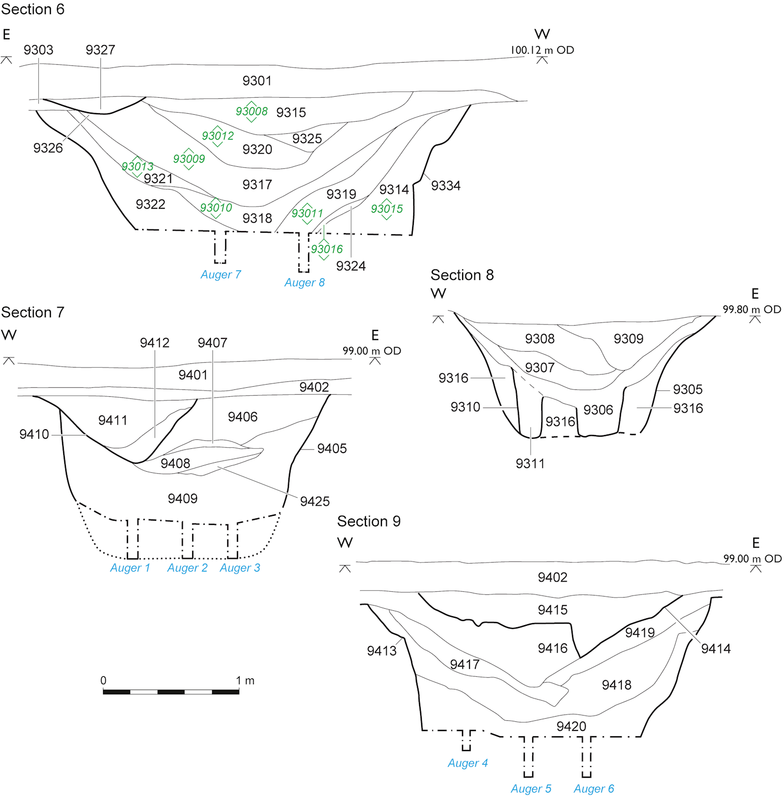 The profile of fills in the southern section suggest that they largely derived from episodes of rapid backfilling, rather than from natural processes. They contained seven sherds of Early Neolithic pottery and 25 pieces of worked flint. The western ditch was 2–3.1m wide and 1.2m deep with steep, slightly irregular sides, the final depth again only ascertained through augering. Ten fills were recorded in the northern ditch section, including eroding turf lines and possible mound material. Three sherds of Early Neolithic pottery, 64 pieces of worked flint, a piece of chalk with parallel striations, antler and a relatively large assemblage of animal bone including cattle bones were present in these layers. A fractured ground stone axe — probably of Cornish gabbro (R. Ixer, pers. comm.) — and a fossil were recovered from the lowest recorded fill, a loose chalk layer. The southern section differed notably from the other ditch sections, with at least half of its depth predominantly filled by chalk, with occasional isolated patches of soil fill. The uppermost fill of this section was cut along the outer side of the ditch by a possible partial recut of the barrow ditch, although this appears to be a localised feature as it was not noticed elsewhere. Archaeobotanical assemblages from the ditches contained material of likely mixed origin including hazelnut shell, wild grasses and vetches, alongside cereals whose excellent condition points at probably being intrusive. No internal features were encountered by excavation, and no mound survived. The character of the ditch fills is interpreted by the excavators as suggesting rapid backfilling, perhaps a 'decommissioning' of the monument (Wessex Archaeology 2016a). As with WS71, a slightly raised profile of the chalk between the ditches may suggest that this area was protected by the mound. 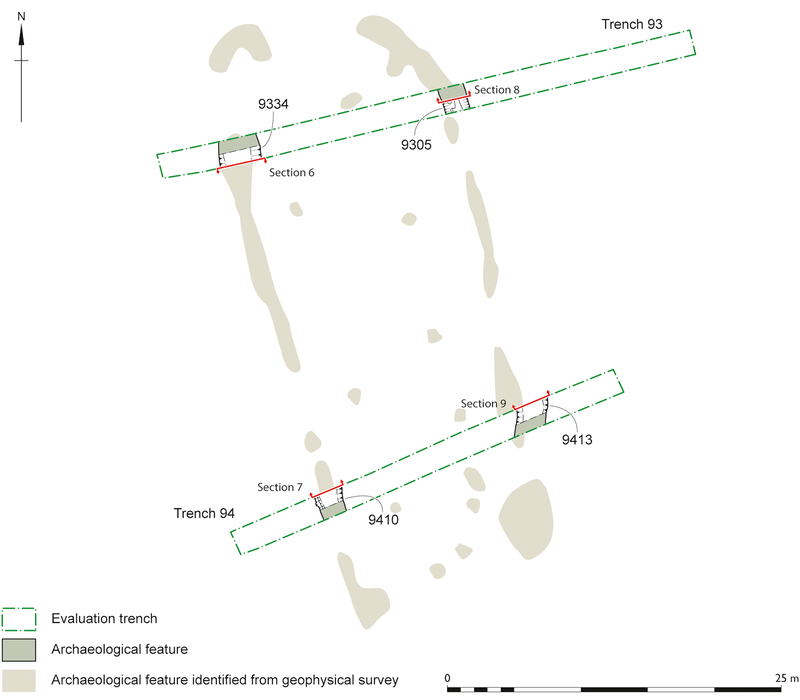 The excavations have not clarified whether the ditches are segmented in the manner indicated by geophysical survey (Wessex Archaeology 2016b; Figure 5). The two barrows thus differ significantly. WS71 is aligned NE–SW, has continuous side ditches and a second pair of internal ditches at its south-western end, as well as internal features, although the nature of these remains unclear. 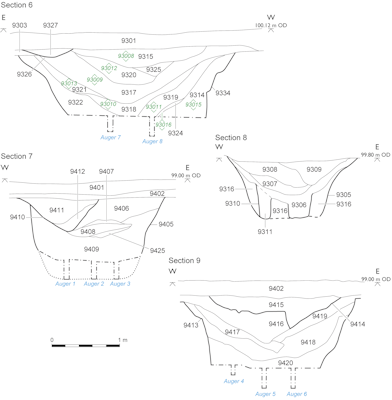 In contrast, WS86 is aligned NNW–SSE, has segmented ditches and more coherently arranged internal features. WS86 provided clearer dating evidence than WS71, although the morphology of both features very strongly suggests that they are both long barrows. The ditches of WS86 appear to have been rapidly backfilled, and the latest dating evidence from the ditches is Middle Neolithic. WS71 shows evidence of a recutting of at least part of its ditches, possibly during the Late Neolithic, and that infilling of the recut appears to have been completed in the Late Bronze Age.